Before we even found out we were having a girl, I knew the nursery was going to be super simple with only hints of either blue or pink. I also knew the walls would be grey and the furniture would be white, regardless. I didn't want to do a theme I just keep it very warm and simple. We actually got all our furniture before we even knew the gender! Below I go through each item in her nursery. 1. 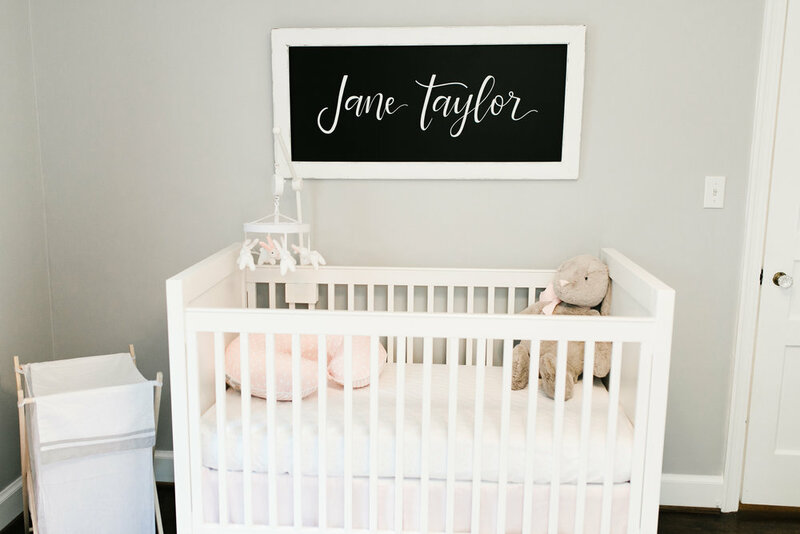 Crib & Chalkbord: I got her crib at Pottery Barn Kids and it has since sold out. But there are lots of similar styles. I loved how simple this crib is and that it could hopefully be used for more than one child. I also knew I wanted her name over her crib so I asked my friend Laura Crawford to work her magic. I am obsessed with how it came out. Before she was born I would just sit and stare at this chalkboard. I still do now that she is here. 2. Mobile & Boppy: The mobile is so funny to me because it looks so cute on the crib, yet all the books tell you not to keep on the crib while the baby is sleeping there. We take it off while she is sleeping but when I need a distraction for her, she really does love it. The boppy and the newborn bobby are a MUST. The boppy and boppy slipcover are a must if you are breastfeeding. 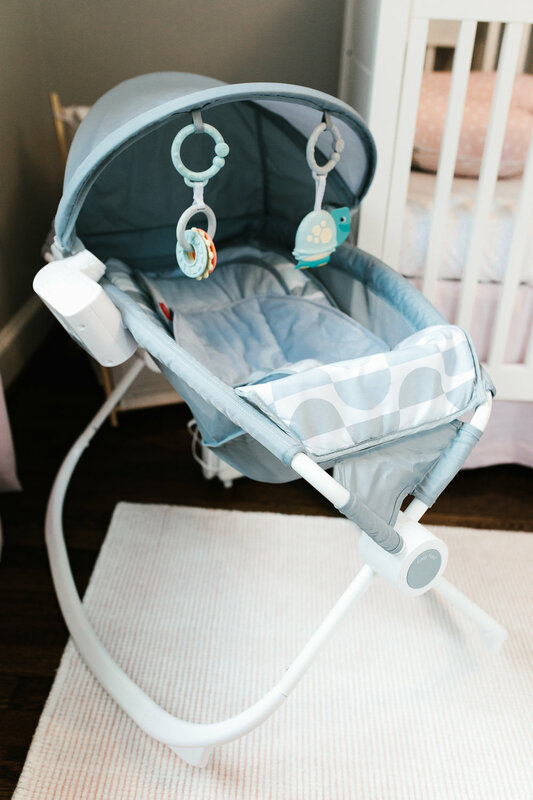 The newborn boppy is great for a spot for the little one to hang out. 3. Rockin-Play: This is the one thing everyone said I had to have. And let me tell you..they were RIGHT. We had her in this all the time up until she was about 7 months old. She loves it and I love that I can control the settings with my phone. 4. PlayMat: This play mat comes from High Street Baby. It was a gift at one of my showers. I get more questions on where this is from than anything else. 5. Changing Table, Mirror, and Diaper Pail: I love how the changing table is also her dresser. We have a tiny house so we need all the space saving we can get. Her mirror is from Etsy. Those little handles on the mirror are starting to become a little tricky since she is getting to the stage where she wants to grab EVERYTHING. The diaper pail does exactly what it is supposed to do. And I love it. 6. Bookshelves: I first saw these on Chronicles of Frivolity and thought they were the greatest thing ever. I love the way they look and I am impressed with how many books they will hold. 7. Bouncer: This is a great item to have to take with you around the house. I am always needing something quick to place her in and this is easy to carry around. She also used to take naps in this every once in a while. 8. Brittany Fuson Prints: Y'all. I have been dreaming of the day when I would get to fill a wall in my house with Brittany Fuson Prints. I have never had a spot that would work before because 1) I live with a boy and 2) our houses have always been so small that I don't have an office/closet/girlie spot where it would work. So when we found out we were having a girl I knew the prints were going in the nursery. 9. Rocking Chair, Side Table & Lamp: This is my favorite spot in the whole house. I spend more hours in this chair than I do anywhere else. And the most precious moments take place right here, holding my sweet girl. 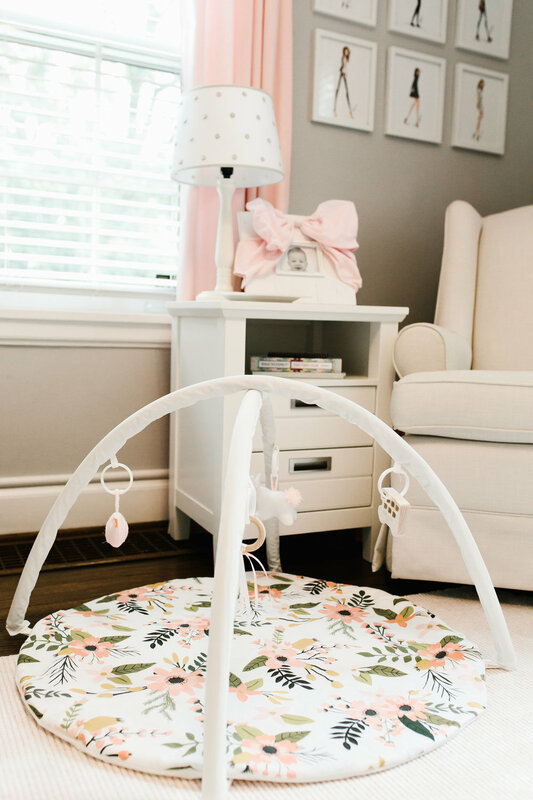 To shop all the items in the nursery just click below. Getting to decorate a space for my little girl was very fun. But the best part of the nursery is seeing her in it.